How fat is Schrödinger's cat? 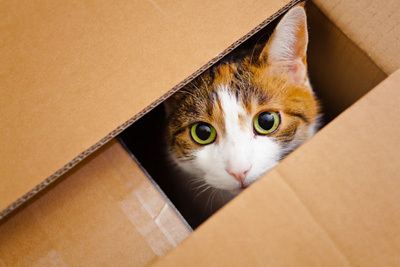 In recent years physicists have been placing ever-larger objects into states of quantum superposition – the curious state that Schrödinger’s cat finds itself in. Now, researchers in Germany have devised a way of quantifying just how macroscopic those objects are and how much ground still needs to be made up before cats and other familiar items can be held in two or more quantum states at the same time. Erwin Schrödinger’s famous thought experiment involves a cat in a box that is simultaneously alive and dead until an observer looks at it. This is an extreme example of a quantum effect called superposition in which a physical system such as an atom or photon can exist in two or more quantum states until a measurement is made on it. While superposition is a regular feature of the microscopic world, it is never seen in our everyday lives. Some physicists think that this conundrum is resolved by quantum mechanics simply breaking down above a certain size scale. Others believe instead that the transition is more gradual, with it becoming increasingly difficult for larger quantum objects to remain in a superposition. This is because the effect of environmental noise on a quantum state is essentially the same as making a measurement. To find out exactly how and where the quantum world ends and the classical one begins, physicists have been placing bigger and bigger objects into quantum superpositions. These include groups of atoms reaching different heights within an atomic "fountain", and large molecules made to interfere with themselves in double-slit-like experiments. Currents of microamps have also been observed to flow in opposite directions around a superconducting circuit at the same time. However, there had been no unambiguous figure of merit that physicists can use to compare the size or "macroscopicity" of different experiments. Previously, researchers defined this quantity in terms of a system’s specific states, but this approach is not entirely objective. For example, if counting particles within a molecule, it is not clear whether the yardstick should be the number of atoms that the molecule contains or instead the sum of all of its protons, neutrons and electrons. Now Stefan Nimmrichter and Klaus Hornberger of the University of Duisburg-Essen have defined macroscopicity in terms of the experiment used to realize a certain quantum state rather than as a property of the state itself. They devised a general mathematical expression to describe the minimum modification that would need to be made to the dynamics of Schrödinger’s equation in order to destroy a certain quantum state. The macroscopicity of a given experimental result is then determined by the number of such modifications that the result has ruled out, with a more macroscopic result ruling out more modifications. This scheme mainly relies on knowing the duration, or "coherence time", of the superposition in question, since a longer-lasting superposition rules out a greater number of modifications – both the stronger ones associated with a shorter coherence time as well as some weaker ones. But an object’s mass is also important, with a more massive molecule, for example, ruling out a larger class of modifications than a lighter one would for a given coherence time. These two parameters, together with a third related to the scale of the superposition, yield a single number, µ, on a logarithmic scale, such that the superposition state of the object has the same macroscopicity as that of a single electron existing in a superposition for 10µ seconds. Nimmrichter and Hornberger find that the most macroscopic superposition to date was done using a molecule of 356 atoms. Carried out in 2010 by a University of Vienna-led collaboration, of which they were part, this experiment produced a µ of 12. The pair also show that atomic interferometers produce high µ values, but that superconducting quantum interference devices (SQUIDs), while creating superimposed currents with many electrons, yield lower values because their delicate quantum states last only a few nanoseconds and because electrons have such a low mass compared with atoms and molecules. Looking to the future, the researchers estimate that clusters made up of some half a million gold atoms could shift µ up to around 23. But they calculate that self-interference of silicon-dioxide nanospheres could yield macroscopicities that are nearly as high. As the experiment in this case uses a double-slit interferometer it is conceptually more straightforward than that of the Vienna group, which requires three separate diffraction gratings. However, according to Nimmrichter, it is technically difficult because it involves reducing the thermal motion of the nanosphere down to its quantum ground state, which no-one has managed to do yet. Even if such hurdles can be overcome, physicists will still have some way to go before realizing a Schrödinger's cat. By modelling the cat as a 4 kg sphere of water and assuming it to exist for one second in a superposition of simultaneously sitting in two places spaced 10 cm apart, Nimmrichter and Hornberger calculated it would have a µ of about 57. As Nimmrichter points out, that is equivalent to an electron existing in a superposition for 1057 s – some 1039 times the age of the universe. "One should never say never," he adds, "but we will probably never be able to put a cat in a quantum superposition." In fact, according to Tony Leggett of the University of Illinois at Urbana-Champaign, this gulf between the properties of quantum objects studied in the lab and those of Schrödinger's-cat-like objects should form the basis for any definition of macroscopicity. "My gut reaction is that while the idea in this paper is a clever one, it is facing in an irrelevant direction," he says. "Rather than referring to quantum mechanics in its formulation, macroscopicity should instead reflect our ‘common-sense’ intuition of the difference between an electron being in an indefinite state and a cat being in an indefinite state."